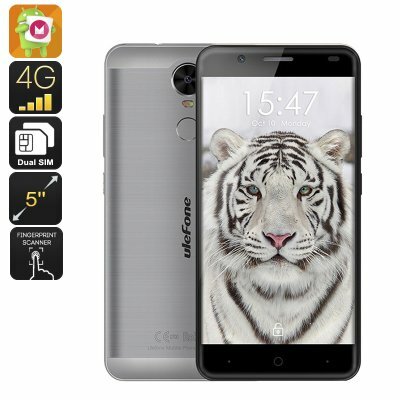 Successfully Added HK Warehouse Ulefone Tiger Smartphone - Android 6.0, Dual-SIM, Quad-Core CPU, 2GB RAM, 5.5 Inch IPS Display (Grey) to your Shopping Cart. As the name of this Chinese smartphone suggests, the Ulefone Tiger is a magnificent device that holds stunning beauty from the outside and packs some serious power within. Coming with a stunning 5.5 Inch display this Android phone allows you to enjoy all media in stunning beauty. Its IPS technology displays vivid colors and great detail, truly letting all media come to life in the palm of your hand. Whether you like to browse the web, enjoy a movie, or play an online game – the Ulefone Tiger is guaranteed to meet all your mobile entertainment demands. Running on an android 6.0 operating system this Android phone is guaranteed to deliver a smooth user experience that comes paired with all the familiar and trusted features Android users are used too. An ultra-fast fingerprint scanner located at the back of the phone helps you to protect your files and lets you unlock your phone in less than 0.2 seconds. From now on you can be assured that all your personal files are stored securely and that nobody but you will enter your smartphone. Additionally, this Chinese smartphone also features OTG technology, allowing you to connect external hardware devices such as a keyboard or memory pen to your phone – significantly enhancing your overall user experience. Packed within this stunningly sleek smartphone you will find a powerful Quad-Core CPU that reaches speeds up to 1.3GHz. This chipset along with the phone’s 2GB RAM ensure that you will undergo a fast and smooth user experience that is capable of handling the most demanding of situations. The Ulefone Tiger furthermore features a Mali-T720 GPU, letting you enjoy stunning detail while engaged in your favorite games or movies. Coming with a 4200mAh Lithium-ion Polymer battery you now can enjoy all your smartphone has to offer for countless hours in a row without ever needing to fear about running out of juice. 4G connectivity provides you with the fastest mobile data speeds out there, perfect for browsing the web, downloading files, or making online video calls with your friends and family. Packing a sophisticated 5MP front camera the Ulefone Tiger allows you to make high-quality video conversations at any time of the day and additionally offers all means necessary to snap pin sharp selfies of you and all your friends. This Android phone takes connectivity even further by offering Dual-SIM and IMEI numbers, allowing you to be connected to two mobile network providers at the same time. Being reachable on two phone numbers simultaneously while using just one device makes the Ulefone Tiger the perfect phone for businessmen who like to efficiently separate their work and private life. The Ulefone Tiger comes with a 12 months warranty, brought to you by the leader in Android Phones as well as wholesale electronic gadgets..